During my time at NI Week I decided to bring my video camera and record the presentations, Tech Theater and LAVA BBQ. It took a while to figure out how to compress the 5GB HD .mts files to a more distributable avi format but with the help of crelf I finally got them compressed and uploaded to the ftp sites. Vi Engineering and Distek Integration have also volunteered their ftp servers to help distribute the videos Thank you Chris and Ed for your help. The avi files can be downloaded from one of the 3 ftp sites they range in size from 150 to 300MB. I would strongly recomend using an ftp client to transfer them to your computer. 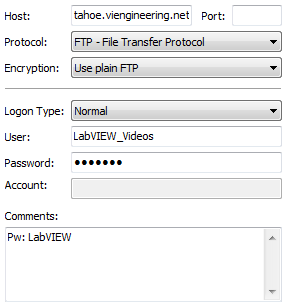 A web browser may work but if you want to download multiple viedos the ftp client makes things much easier. 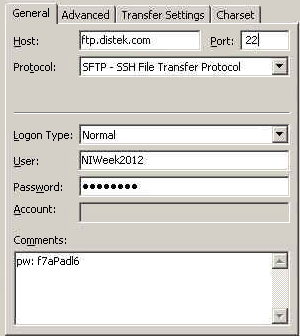 To download videos from Distek they are requiring you to use an ftp client. My ftp client of choise is FileZilla and it is free. login and password is case sensitive. if you are using Filezilla your site manager window will look like this. Please Note: You will not be able to access the FTP through a web browser! You MUST use an FTP Software Client to access the FTP. If you have any issues downloading the videos or you are unable to view them please post to this topic. Thanks for posting these. Downloading now. If you are using firefox, fireftp is my preferred FTP client. Pretty lightweight and integrates within firefox. Thank you for doing this. I wanted to get a clone so I could attend multiple presentations... Now I will be able to see the ones I missed. I wish NI took care to record and upload the entire NI week including the the vis that were demonstrated. That's great Mark, thank you for taking the time to do this. It's 5.29 A.M., my eyes are red and I just finished Norm's video about the rebirth of state machines. IT IS A MUST SEE!!! There are so many good sessions that my head spins but for now I simply love this one. I totally agree this was the best session of NI Week for me. Mostly because I had fallen into the same trap where I wasn't separating my states from my actions. I liked this session so much that our next user group will be using this as our main topic. Hopefully with Norm presenting in person. If you are looking for the offical NIWeek 2012 youtube videos. How nice to here the combination of words: "official NIWeek 2012 youtube videos". Thanks. However, sadlly, non compares to what you did and it's a shame. The world disney effect of NIWeek is not what interests me. Thanks so much for recording these, and making them available! I would like to add my thanks to all the others here, this is really great for those of us not able to attend such a great event. I don't know, but I believe the slides should be available in the group Mark linked to earlier. There was another person video recording sessions. I spoke with him at NI Week and he did record Darren's as well as other sessions. He promised to send me a DVD of all of his recordings and when I receive them I will upload them to the ftp. the videos just start playing and after like after 5mins. I equally downloaded divX codecs as indicated by Mark, to no avail. Check the size of the files compared to the size the FTP client says they should be. My guess is that the files weren't downloaded fully (something which can happen with FTP) and AVI files are built in such a way that the file can be played even if you only have part of it. I can say that I watched quite a few of them fully. If this is really the issue, you could try another FTP client (such as FileZilla). The CLA 2013 videos are now available. The CLA 2013 videos are only posted on the Tecnova server. NIWeek 2013 videos are ready for download. Are the NI Week 2012 vids gone? I was looking back (after showing some of the new ones to co-workers) at my collection and wanted to grab a few more but they appear to be gone.